The first 3D PC game ever! 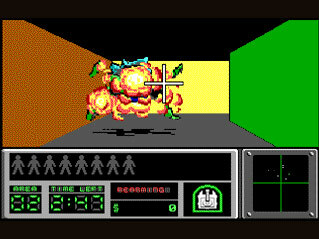 Hovertank 3D debuted the amazing technology that was used to usher in the First Person Shooter genre with Wonfenstein 3D. You are mercenary Brick Sledge, and you've been hired by an unknown organization to rescue people from cities targeted for limited nuclear strikes. With an energy cannon as your main weapon, you must race against the clock, blasting away at nuclear mutants, armored patrols and other terrors bent on your destruction. Innocent lives depend on you and your Hovertank. Get in, get `em, and get out, before you get nuked!